An empowering book for women that I HIGHLY recommend is being released today. by Rachael Jayne Groover, inspirational speaker and founder of The YIN Project. This book is important because many women don't know what kind of energy they give off to others. In their desire to be strong and independent, many women have shut themselves off from their softness, their sensuality, and the feminine energy that not only would make their lives more pleasurable and fulfilling, it would give them a radiant power--which happens to be what men desire most. On the other hand, some women have connected more to their feminine energy, but when they express their confidence and power they seem to intimidate others. This book answers the question why some women effortlessly attract the healthy attention they want (from men and women) in a magnetic and non-threatening way, while others do not. In Powerful and Feminine, Rachael Jayne teaches a series of 35 unique and profound practices that will increase your personal presence, your feminine energy, and your vocal power immediately. Not only can you then walk into any room and attract the attention you want; you can be a Light for others. 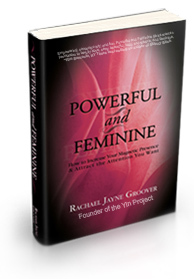 Whether you want to take your business or project to the next level, or you want to attract an aware, loving, masculine partner into your life, all the exercises in Powerful and Feminine will help you be seen and be heard in a powerful way. • How connecting with your feminine essence can accelerate your spiritual growth. 100% of the profits from today's book sales are going to V-DAY.org to support their worldwide programs to stop violence against women and girls. Do yourself and others a favor; buy an awesome book and make a difference today. P.S. Check out the 2 valuable training bonuses you get when you buy the book TODAY, and the New York Times Bestsellers who have endorsed this ground-breaking book.